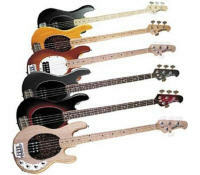 If you're looking for PROFESSIONAL QUALITY bass lessons then you're at the right place. If you'd like to learn your favorite songs. If you'd like strong musical BASICS taught to you or your son or daughter. If you'd like to have fun & learn how to play the bass then you have found the right place. ABBEY MUSIC STUDIO! We are proud to offer lessons taught by a University degreed professional. Our teachers have had 20 years of experience, teaching, playing professionally in Wisconsin area local bands, writing & recording CDs which have been played on Milwaukee radio, and playing weddings and charity events. Lessons are given 7 days a week which make them very flexible for families or people with hectic schedules. Lessons are usually held on the same day once a week for a half hour. (Hour lessons are also offered) But may be changed from week to week. Lessons may be rescheduled, without penalty, if done 24 hours before the lesson. We recommend that you call and schedule your first lesson to see if ABBEY MUSIC is right for you. There is no minimum number of lessons to pay for when you start out. Just come in and see what ABBEY MUSIC STUDIO has to offer you or your children. You won't be disappointed. © Copyright 2018 ABBEY MUSIC. All Rights Reserved.